Everyone's favourite Christmas caper is now an all-new, definitive DVD set with an armoury of extras including multiple deleted scenes, seven featurettes and great games. Features a cast of comic greats including Macaulay Culkin (Saved), Catherine O'Hara (A Mighty Wind), Joe Pesci (Lethal Weapon 4), Daniel Stem (Bushwhacked) and John Candy (Canadian Bacon), this "charming film" (New York Times) can "un-Scrooge just about everybody" (New..
Own Home Alone - The Holiday Heist DVD from Deff, DVD, Blu-Ray & 4K Video Specialists - Free UK Delivery..
Home Alone: Eight-year-old Kevin McCallister (Macaulay Culkin) has become the man of the house, overnight! Accidentally left behind when his family rushes off on a Christmas vacation, Kevin gets busy decorating the house for the holidays. But he's not decking the halls with tinsel and holly. Two bumbling burglars are trying to break in, and Kevin's rigging a bewildering battery of booby traps to welcome them! Written and produced by Jo..
Home Alone: Eight-year-old Kevin McCallister (Macaulay Culkin) has become the man of the house, overnight! Accidentally left behind when his family rushes off on a Christmas vacation, Kevin gets busy decorating the house for the holidays. But he's not decking the halls with tinsel and holly. Two bumbling burglars are trying to break in, and Kevin's rigging a bewildering battery of booby traps to welcome them! Written and produced by Joh..
Home Alone: Eight-year-old Kevin McCallister (Macaulay Culkin) has become the man of the house, overnight! Accidentally left behind when his family rushes off on a Christmas vacation, Kevin gets busy decorating the house for the holidays. But he's not decking the halls with tinsel and holly. Two bumbling burglars are trying to break in, and Kevin's rigging a bewildering battery of booby traps to welcome them! Home Alone 2: Kevin McCa..
Home Alone: When Kevin McCallister’s (Macaulay Culkin) family leaves for Christmas vacation, they forget one thing: Kevin! So the eight-year-old starts decorating for the holidays. But when two bumbling burglars (Joe Pesci and Daniel Stern) try to break in, Kevin rigs a hilarious array of booby traps for them in this comical holiday hit! 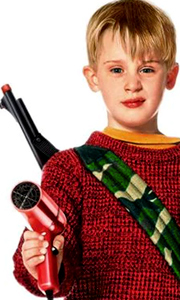 Home Alone 2: This year, Kevin (Culkin) is spending the holidays in New York City. Unfortunately, hi..
Home Alone: Eight-year-old Kevin McCallister (Macaulay Culkin) has become the man of the house, overnight! Accidentally left behind when his family rushes off on a Christmas vacation, Kevin gets busy decorating the house for the holidays. But he's not decking the halls with tinsel and holly. Two bumbling burglars are trying to break in, and Kevin's rigging a bewildering battery of booby traps to welcome them! Miracle On 34th Street : ..
Great news - Kevin McCallister (Macaulay Culkin) is spending the holidays in New York City! Bad news - his parents are spending them in Florida! Separated once again from his family, Kevin manages to find food, lodging and fun using his dad's credit card. But his big-spending solo act takes a dangerous turn when the Wet Bandits, Harry and Marv (Joe Pesci and Daniel Stern), escape prison and also land in the Big Apple. Now, Kevin must ou.. The U.S. Air Force has a new secret weapon - and he's only eight years old! From comedy legend John Hughes comes the hilarious, action-packed hit that's "lots of fun for the entire family!" (Kids News Network) A band of international crooks has hidden a military computer chip inside a toy car, but an airport mix-up lands it in the hands of whiz-kid Alex Pruitt (Alex D. Linz) who's home alone with the chicken pox in a quiet Chicago subur..
Accidentally left behind when his family rushes off on a Christmas vacation, eight-year-old Kevin McCallister (Macaulay Culkin) embarks on a hilarious, madcap mission to defend the family home when two bumbling burglars (Joe Pesci and Daniel Stern) try to break in - and find themselves tangled in Kevin's bewildering battery of booby traps! Special Features Feature Audio Commentary With Director Chris Columbus And Macaulay Culkin, 1990 ..
Own Home Alone - Filthy Animal Mug from Deff, DVD, Blu-Ray & 4K Video Specialists - Free UK Delivery..
Own Home Alone - Les Incompetant Mug from Deff, DVD, Blu-Ray & 4K Video Specialists - Free UK Delivery..
Own Home Alone - You Guys Give Up Yet Mug from Deff, DVD, Blu-Ray & 4K Video Specialists - Free UK Delivery.. It's tough being nine... Tougher still is spending Christmas with dad (Jason Beghe) at his new girlfriend Natalie's (Joanna Going) mansion even though it's loaded with all the techno-gadgets any kid could hope for! But this Christmas, Kevin (Michael Weinberg) is really in hot water again, and so are Marv (French Stewart) and his sidekick (Missi Pyle), who are up to no good! With funnier and more high-tech, crime-stopping wizardry at his..